The Knicks' unexpectedly dominant start to the season has stirred up a lot of "yeah, but." To wit: "Yeah, but the Heat weren't trying," "Yeah, but these teams are missing their best players," "Yeah, but they're just hitting a lot of threes," and after their most recent, sloppiest win over the Magic, "Yeah, but you can't get away with an off night like that against the Spurs." And that latest "yeah, but" resonated around the early fourth quarter of last night's 104–100 win over the Spurs. The Knicks had played a valiant, competitive first half, but with the Spurs bottling Carmelo Anthony on one end and riding Tony Parker dribble drives to basket after basket on the other, New York began to fray. With around seven minutes remaining in the game and the San Antonio lead swollen to twelve, a sense of acceptance — yeah, the Knicks are good right now, but not good enough to beat the league's best on an off night — set in. False, as it turns out. After it spent a full eighteen or so second-half minutes at a standstill, the New York offense erupted. Raymond Felton and Carmelo Anthony — both bedeviled all evening by punishing help defense — bulled into the jaws of San Antonio's defense, baiting help defenders then diverting the ball out to the perimeter, where Jason Kidd and J.R. Smith lay in wait to drain deficit-chomping threes. Offense begot tighter defense, momentum swung, and Tyson Chandler's thunderous put-back dunk left no doubt. 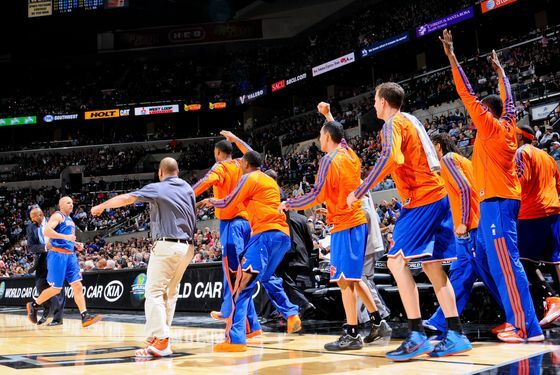 The Knicks beat the league's best on an off night — the first time they'd won in San Antonio since 2003. They're 7 6–0 now, and [looks over shoulders] they might actually be the best team in the NBA. Don't look at me like that. I feel strange saying it. Now, they have to follow last night's magnificence with another road game against the exceedingly hot Grizzlies, so that best-ness will be tested immediately. Before everyone moves on, though, Carmelo Anthony deserves a bit of special recognition for the best 3–12, nine-point outing I can remember. The Spurs had Melo covered. They bludgeoned him with three or four defenders of different sizes, fronting him relentlessly in the post and doubling him forcefully whenever he made his move. Upon identifying that defensive approach, Melo was faced with a choice. Two roads diverged in AT&T Center. He could defy the targeted defense and try to score anyway, leaning on the arsenal of evasive moves and high-difficulty shots that serves him very well on occasion. Or he could cut his individual losses, trust his teammates to score, and expend his energy elsewhere. Anthony's not prone to the latter, but there he was, sending passes cross-court and up around the perimeter to assist or hockey-assist many of New York's biggest baskets, wrestling big men beneath the rim to recoup misses, and flinging himself in front of San Antonio drives during those final five or six minutes of lockdown defense. Felton deserves plenty of credit for matching Tony Parker's production off the dribble, but even on a bad shooting night, Melo stood squarely yet silently at the center of New York's offense. When the Spurs took his plan A, Anthony turned unflinchingly to a plan B rarely seen in past years. Whether or not Knicks fans are ready to accept it — and I'm still too dazed by all this to accept anything — the folks who talk are starting to talk about New York as a genuinely elite team. At this point, they could completely fall apart in Memphis tonight and still remain in that conversation (and if they somehow beat the Grizzlies, oh man ... ). The Knicks will slide at some point, because even the best teams must. The "yeah, but" is running dry, though. The Knicks might just be this good.